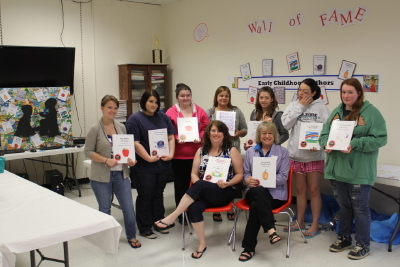 I recently completed a residency with Melissa Pellin’s Early Childhood Education class at the Region Two School of Applied Technology in Houlton, Maine. We worked over the course of the year on writing and illustrating a children’s book. The books were published in hardcover form,two copies each, complete with ISBN’s, and we celebrated on Friday with a book launch party, combined with a book give-away to each young author, courtesy of World Book Night. (The book: “local author” Steven King’s “The Stand.”). It was an amazing experience for all involved, and kudos are owed to first-year-teacher Ms. Pellin for her hard work, and to last-year-Principal Michael Howard (he’s retiring) for his vision in making this happen. And, of course, to the authors and illustrators for their hard work and creativity. I’m sure the future holds good things for Melissa, the graduating students, and Mr. Howard. Bravo! Pictured here are eight of the authors with their books, and the gift they gave Mr. Howard to celebrate his retirement: a canvas covered in famous Maine children’s books, along with their books. Need a new angle for Dr. Seuss’s birthday? Tired of “Cat in the Hat” parties? This year, celebrate the good doctor’s birthday and Read Across America by writing your own Dr. Seuss-style story. As a Seuss fan and author of a half dozen of my own rhyming books, I’ve developed a special “Dr. Seussinator” mini-writing workshop for elementary school children in which they write their own version of a Seuss favorite. This year, send the kids home with their very own rhyming book. Make it “Read AND Write Across America” Day! This writing workshop takes the difficult and abstract topic of diversity and tolerance and helps students to express themselves on the topic and then to create a few short, powerful quotes on the subject. These quotes can be combined with other efforts (using artwork, for example) to celebrate diversity and prevent bullying in a school system. Amy developed the workshop at the request of a Kennedy Center for the Arts partner in Sarasota, Florida, in conjunction with the international 2011 Embracing Our Differences Exhibit which is held there each year. 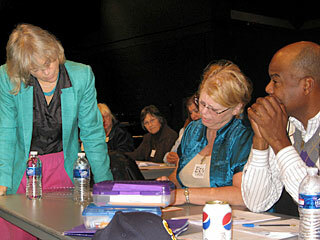 It is available as a Professional Development or as a student Writing Workshop.